Western Red Cedar (Thuja Plicata) is a softwood from the Cypress family of trees. This timber is available in two colour ranges: light to medium (L/M) and medium to dark (M/D). Within these two colour ranges however, you will find a wide variety of tones, from milky white to chocolate brown. This means one blind or shutter can contain a variety of shades. That’s why Western Red Cedar Plantation Shutters are usually used where a very natural timber look is required. These shutters are also available in a range of paint colours, although many consider it a shame to paint over the grain of these beautiful timber red cedar shutters . 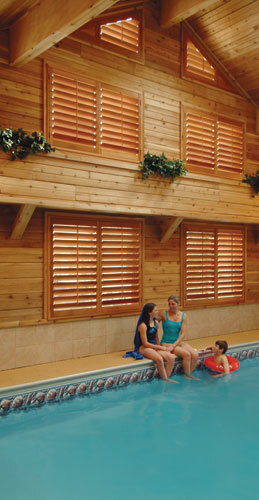 Western Red Cedar shutters are coated with a UV-stabilised lacquer, which will not yellow. However, that doesn’t stop the timber under the finish being affected by the sun. You can expect Western Red Cedar to bleach over time, but this happens gradually, depending on the level of exposure to the sun. 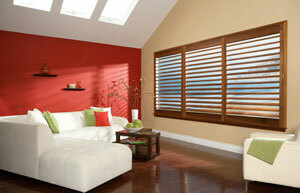 This will give the plantation shutters or blinds a mature, aged look. Being a very soft timber, Western Red Cedar shutters are best not be installed in high-use areas, or places where they may be bumped or knocked regularly. There is little that can be done to repair this type of damage. Western Red Cedar is used in blinds and shutters because it is a very stable timber. Warping or bowing problems are rare. In its natural state, Western Red Cedar is highly moisture-resistant. However, the lacquer finish used on these shutters is designed for interior use only, so they are not recommended for wet weather areas. The Western Red Cedar timber used for our blinds and shutters is grown primarily in plantations in Canada and North America. It is relatively slow growing, but readily available. The plantation forests are managed for sustainability, ensuring an environmentally-friendly and ongoing supply.